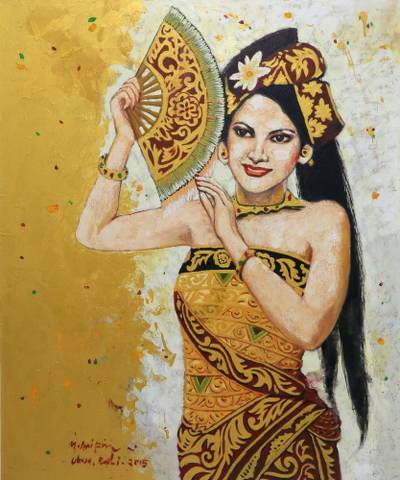 Original Portrait in Oils of a Balinese Dancer, "Beautiful Woman"
"This is Dina, an Indo-Dutch woman who came to Bali with her father, who is himself the friend of a Balinese Hindu priest. One day, there was a sacred ceremony in the temple and Dina had the opportunity to dance with other dancers," artist Mohammad Arifin recalls. He depicts the beautiful woman in a batik sarong as she flutters a fan. "The canvas is a great place to depict inspiration; all work is just like natural movement." "My name is Mohammad Arifin, I'm a painter from East Java. I was born on April 7, 1975. I learned to paint when I was 20 years old. In 1997, I studied in the Fine Arts School in Yogya. Senior painters like Mohammed were my first teachers. Traditional scenes, human interaction, and the beauty of nature inspires my artistic feeling much more than others. In my art, both learning and the discipline of work are important. They have helped me to create a very personal and genuine art form. "To promote my artwork I do many exhibitions in several places in Bali and Jakarta. Within the art community, there is also a lot of communication among other artists. We often visit each other and hold joint exhibitions. Life emotions are an important part of my creations. Creation never knows end. It is like a journey that we never know when and where we will stop. It is a never ending story in our life. "There are some specific experiences that pull me to painting; brush strokes are a spontaneous movement, just like drops of rain. It is always amazing to recognize. Along my art journey, I have received some prizes and much appreciation. "Oil is my medium on canvas. The canvas is a great place to depict inspiration; all work is just like natural movement. Whenever inspiration comes is the time to express my contentment. Art is contentment. Pure heart is its real media to express. Happiness is its end." When I opened your beautiful painting today I gasped! The colors are so vivid. I am most drawn to the woman's eyes. There is such a soulful look in them that makes me wonder what she was feeling at the moment you captured her for your painting. I am so pleased to add your painting to my every growing collection and would be even more pleased to add more. Thank you for sharing your work with world!